Ice And Global Warming | Let's Live Forever! A little while ago I had a mini “Iceberg Series”, and I thought I’d finish it off with a post about REAL icebergs. 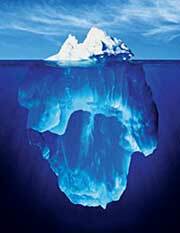 The other posts in the iceberg series are On Overcoming Obstacles followed by Think And It Shall Be So. Many people are concerned about global warming, polar ice and sea levels, so I thought I’d write about some of the things I discovered about these when I was writing books about climate for the 8 to 10 years age group, over last (Australian) summer. I am not covering the causes and extent of climate change here—that is done very well elswhere. This is just about the ice. There’s lots of ice floating on the sea at both the north and south poles—especially at the north pole which is covered by the Arctic Ocean. When any of this ice melts, the sea level rises—but this doesn’t happen in the way we might think. It’s not actually the water from the melted ice that contributes to a rise in sea level. This is because floating ice is mostly underwater anyway, and because ice has a lower density than water… as ice melts the lattice of water molecules collapses and the molecules intermingle, so they take up less space. Why does the sea level rise? 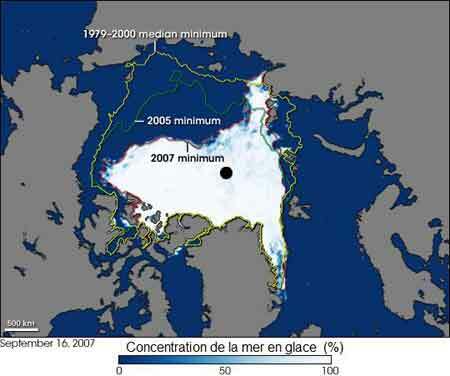 As floating ice melts, more sea becomes exposed. Without the reflective white covering, the sea absorbs more heat, and therefore expands. 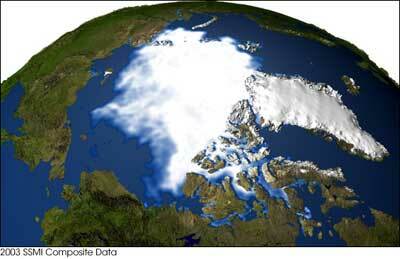 The expansion of the seawater is what is causing the rises in sea level that have been recorded in recent years. The pictures show it all—these NASA images of the Arctic in 1979, 2003 and 2005 show less ice on the sea (the ice on Greenland and the islands has not decreased dramatically). The ice expands and contracts over the seasons—these images were made at times of least ice for the year. …is a collection of sea routes that run across the top of North America, between the Atlantic and Pacific Oceans. Up till now only ice-breaker ships could get through, but now it is opening up. In 2007 there were unproven claims it was open to normal ships, and a month ago (August 27, 2008) there were claims it and the Northeast Passage were both ice-free. 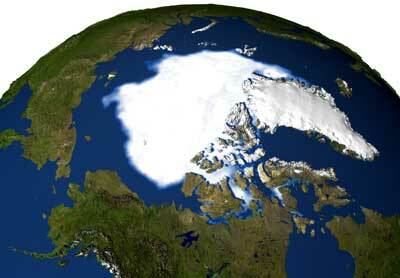 Scientists are suggesting that there may be no summer ice at all on the Arctic Ocean by 2013. 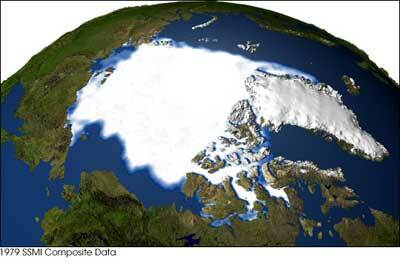 When ice falls from land into sea it causes a rise in sea level because of the water it displaces. The ice sheet on Greenland has broken up a little around the coast. Things are quite different at the south pole, because it is covered with the huge land mass of Antarctica rather than ocean. 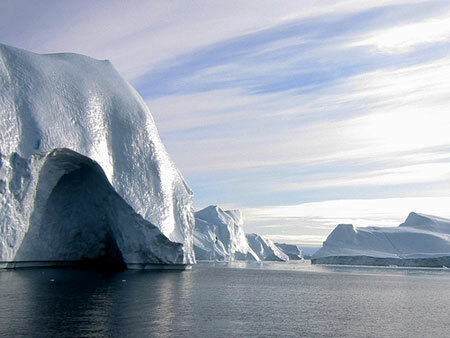 The ice sheet on Antarctica is very thick, and it is very cold—far too cold to melt. Some ice shelves have broken up in the warmest area (the Antarctic Peninsula), but overall it’s thought southern ice is not contributing to rising sea level (though there are some worries about some glaciers in the west slipping away). I’ve noticed that some people describe the global changes to nature that are going on as the reaction of an angry Earth to how it is being treated by mankind, with all the mining, bombs, carbon dioxide and so on. The Earth is dedicated to you. She will make your dreams come true. She will reflect back to you your embodied thoughts. Those who anthropomorphise the Earth and project upon her the petty attitudes of vengeance do not know their Planetary Home. The Earth has never withheld from you forgiveness for your choices. Forgiveness is extended even in the moment your choices are made. I’m not sure, really, of what this passage means, but suggesting the Earth has human emotional reactions does seem a bit silly to me. I’d imagine many of us would like to think we could do something about global warming—for me it’s a question of WHAT we choose to do. To me, learning to tune into our intuition and start fullfilling our life purpose is the fastest way we can heal any situation, including problems with global climate. Even if this takes us in a vastly different direction to icebergs and expanding oceans. Hi Robin. Great work. The description of why the sea levels are rising was interesting and not at all what I had thought. I wish I had some wise words to share, but admittedly I feel a bit hopeless. Setting an example is a start, but I sense there is so much more…. Your suggestion, “…learning to tune into our intuition and start fullfilling our life purpose…” is intriguing. Hey, I learned a lot in this post. Re: Forgiveness is extended even in the moment your choices are made. <–I think what this means is that Nature always finds a balance. This does not give us permission to abuse her, but it does mean that she will always attempt to right herself. I like your conclusion about tuning into our own intuition, and finding personal fulfillment. By doing so, we are more likely to make positive changes in our lives, which in turn can translate to postive changes in how we treat our planet. Interesting stuff and great photos. Well once more, for me at least, your very insightful comments cause me to think… and thinking about it means giving energy to it. I not only like your blog, I like your mind and the way you express it. Thanks again Robin for providing a positive alternative for those who see this time in our evolution as something to fear. There has never been a more wonderful, potential-filled time to live than Right Now! Jeff Bakers last blog post..Satisfaction Guaranteed… Right? Fascinating! I didn’t know many of these facts. Vered – MomGrinds last blog post..10 Bizarre Ads: What Were They Thinking? I enjoyed your conclusion very much. It certainly should deliver the same results that we are hoping for in terms of global warming; albeit in a roundabout way. I like the idea of tuning into our intuition and healing not just ourselves but Earth in the process. Thanks for the lovely sharing! I had “heard” about global warming but I didn’t exactly know all the glory details. Reading your post was informative as well as it answered a some questions I had as well. I can’t believe you have accumulated so much information about such a narrow subject. Our acts toward ourselves are horrendous in every way. What is happening is like your body in a shower: if we increase the water temperature slowly, it will have little affect on us, but if it increases at a rapid rate we will notice immediately. Global warming is like the first example, a slow increase in pollution will not equal a happy planet for the future generations. Again great post, very insightful. @Davina – Thanks – I was interested to discover that about the sea levels, too. @Urban Panther – that’s interesting about the balance thing. @Jeff – thanks Jeff – I think it is a wonderful time right now too. @Chris – very true, I think. @Evelyn – and thanks to you too – I enjoyed that bit when I read it. @Shamelle – hi there – glad to be of service! @Daniel – hi there and welcome – it’s not that much information is it? – I left out a lot! Thanks for your kind words! I think, the generation now (we) is responsible towards the next generation. The “cause” which we do now and the “effect” that will be received by the next generation. Wow, thanks for all this concise information in one place! This isn’t something I would easily find to read in such a manageable form. I’m grateful for your knowledge. My husband and I were watching a program the other day about what the Earth would be like if there were no longer human life on it – the Earth and wildlife would slowly regenerate and make up for all the mistakes we have made with pollution, taking over the natural spaces etc. Isn’t it interesting that scientists have lately been discovering heretofore not known species and some “endangered” ones seem to be recovering? Beautifully thorough, Robin. I think I’d like to read it twice (that’s rare for me). 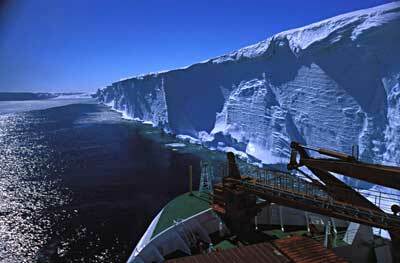 Hi Robin – That ice shelf is amazing. This is an interesting post because I had no idea that it was the actual absence of the icebergs that caused sea levels to rise, as opposed to the extra water caused by the melting ice. I like your idea of using your intuition and following your life purpose to help solve environmental problems. I’m not sure whether I believe the part about the earth’s reactions or not. From what we know so far, it seems like the earth has been around a lot longer than us, or any other species – so who knows. Cath Lawsons last blog post..Would Money Problems Drive You To This? @Lance – thanks Lance! I didn’t know all this either, until I had to research it. @Poetikat – thanks! I didn’t know that about the new and recovering species. @Writer Dad – thankyou – hope it’s OK a second time. @Cath – isn’t the shelf fantastic. I think the Earth does perhaps have its own innate “wisdom” – that might be why it would not be interested in things like revenge? You’re just full of information, aren’t you Robin? That was very well explained, and don’t tell anyone, but you did a much better job of making me understand this stuff than when a relative of mine, who’s an atmospheric chemist, tried to do it. She used so many big science words I totally zoned out. You can see how good you are at your job. Did I tell you I used your MOON book with my son. It’s very well done. Thanks for sharing this informative article. Most interesting and very well explained. Thanks Robin for this great post…, I always wanted to know! In this time and age I find it funny that people still project human traits to, yes the earth, and God too. I had a priest who said that nature never forgives (even made a post on that not long ago) but he didn’t mean it in any personal made, but in the sense that if you kick a rock you get hurt, no matter how sorry you feel afterwards for the rock. I feel the same way. We are just reaping the consequences of we have sown. Hi Robin, well you knew that I would love your conclusion. I agree, improving collective consciousness has to have a healing impact on mother earth. Tom Volkar / Delightful Works last blog post..Why Don’t We Use What We Already Know? What great information, explained in a comprehnsible fashion. Thanks so much for sharing this! @Kelly – thanks – yes you DID tell me you got out the Moon book! @Effortless Abundance – Hi there and welcome! Thanks. @Maya – Ta – not only that, but the less noble human traits. @Miguel de Luis – hi there – I guess we tune into the ideas that we find most helpful – thanks for your comment! @Tom – glad you liked it Tom! @Rita – glad you are better Rita! Thanks to you too. I’ve been thinking about what I can do to help the situation. Using my baby step approach, I’m creating a list and taking it one baby step at a time. First on my list is buying more local fruits and veges to decrease the gas/energy/carbon footprint of bringing fruits and veges to my family. Very interesting read Robin, (even though I had to go over it 2/3 times (I’m not too smart)). Sometimes when I read about the damage that is being done to the earth, it makes me feel sad, but as mentioned in the quote, the Earth forgives us in that it does heal itself if only we would leave it alone…way back when, cropping was done for 7 years and then the earth (or the ground) was supposed to rest a year, thus given a chance to ‘heal’. Not so much today, we ask back a lot from the earth and maybe we could do a better job in taking care of it. I have faith that the earth will remain and will be okay, despite the outlook. Robin, this is a great post! Certainly not what I expected it to be. I thought it would be a geography lesson but it was much deeper than that. I also believe that by changing our beliefs and expectations we can help create a better Earth. Thanks for introducing the Third Millenium book, my initial feelings are that this would be a great read. I liked, “The Earth is dedicated to you. She will make your dreams come true. She will reflect back to you your embodied thoughts.” This makes me ask, what thoughts is the earth reflecting back to us? What thoughts are we sending out? I’ve been writing about such topics as well. As have others. Maybe my psyche is just tuned in to that channel, but maybe, just maybe we are all undergoing a sea change? Can hope! G.
Graces last blog post..What is 400 feet tall and goes whoosh? @Harmony – My goodness – good looking? It took me HOURS to find photos of myself I could use. What a gorgeous thing to say about the global love! @Natural – I think you are most likely very smart – you work at a desk, or under, after all. That’s so true about the farming mentality – there’s an attitude of taking as much as possible for short term gain – without any regard for the long term health of the land. @Sharon – thanks and welcome! I’m so glad you liked that passage. Hi Robin: Very interesting. I had assumed the sea was rising because when the ice melted there was more water, but you’re right that a glass with ice will stay at the same level after the ice melts. I’ve heard that polar bears are drowning because they’re used to swimming from iceberg to iceberg, and now that so many have melted sometimes they have to swim for a long time without finding an iceberg to rest, they get tired, and they drown. Rarely do I come across a blog that inspires me to subscribe to an RSS feed… This post is incredible and I will become a permanent reader of your blog. I’m always inspired by those that actually put some real content out there. @Marelisa – that’s awful about the bears. Another problem is that microscopic organisms grow under pack ice and provide food for larger animals, and they diminish when there’s less ice. The image with this post reminds me of footage I have seen in Antarctica where chunks of ice cliffs have been crumbling into the water. It is not always as peaceful as this image suggests. Human beings have much to learn about themselves and Mother Nature helps us raise our awareness about the consequences of our behaviour. You don’t exhibit any sense of urgency in writing about climate change, it all sounds like a theoretical thing we can all take some time toponder, and your ‘conclusion’ is meaningless to me. What’s the point of tuning into our intuition and fullfilling our life purpose [whatever you imagine that to be] when the planet is becoming unviable for humans? You don’t mention any practical actions you intend to take, changing your lifestyle for instance. Australia is suffering the longest drought in its history, and is fast depleting the aquifers which supply you with water. This is unsustainable. Nonsense about angels isn’t going to help anyone, the future will be brutish, miserable, hungry and fraught with dangers as humans turn on each other and fight for diminishing resources. Unless somehow the majority wake up to the fact that it’s now close to meltdown and our complex global society won’t be able to cope. Healing mother Earth is just a new age nonsense phrase that ignores what we really have to do to avoid catastrophe. I wish I could believe most humans were up to the challenge and capable of the change necessary; giving up things, giving up shopping and consumption, reducing our impact.